Hydraulic operating mechanism in the aircraft doors market will register around 5.5% CAGR to 2025 owing to growing adoption of automatic actuation mechanisms for easy operation. Commercial aircrafts accounted for a significant share in the aircraft doors market. This share is attributed to the increasing air carrier deliveries across the globe to meet the growing demand. For instance, according to the Center for Aviation, the global commercial aircraft grew by around 4% in 2017 accounting for 31,000 airplanes, thereby providing a positive outlook for the aircraft doors market proliferation till 2025. Passenger doors will exhibit substantial growth over the forecast timeframe owing to its primary usage for entry and exit from the airplane. Proliferating air passenger traffic is positively influencing the market growth over the study timeframe. Cargo doors is expected to witness significant gains over the forecast period with rise in cargo transport. According to IATA, in 2018, the air cargo transportation crossed 60 million tonnes with an increase of around 4.5% as compared to 2017. Air cargo transportation holds significant share and accounts for over 35% global trade by volume. Airliners such as Cathway Pacific Airways are amplifying load bearing capacity to support cargo industry. Moreover, installation of separate cargo specific doors in areas such as bottom of upswept aft portion on underside of the fuselage to ease loading and unloading will support aircraft doors market growth. Hydraulic operating mechanism will register around 5.5% CAGR by 2025 owing to growing adoption of automatic actuation mechanisms for easy operation. The system allows superior accuracy and require less maintenance. Ongoing innovations offering high power to weight ratio and self-contained systems will induce significant potential in hydraulic aircraft doors market size. However, rising concerns for system reliability in adverse weather conditions will limit its growth in the market. In 2018, manual operating mechanism accounted for over 53% aircraft doors market volume share. This dominance is attributed to its usage for passenger and emergency exit in air carriers including regional, commercial, and business jets. The lower cost of the system, along with ease of use and minimum maintenance requirements will further accelerate the segment growth till 2025. OEM holds significant share with door installation during manufacturing. Component manufacturers are adopting innovative solutions to enhance time and cost efficiency of supply chain. Moreover, industry players are integrating supply chain to reduce complexity and ease material availability at each stage. Aftermarket showcased a significant growth rate over the forecast timeframe owing to the on-condition inspection for ensuring air-worthiness. Additionally, extensive MRO requirements for overhauling and restoring old airplane fleet are further expanding the aircraft doors market share over the study timeframe. North America leads the aircraft doors market place owing to the presence of major airplane manufacturers. Increasing military budget allocation for maintaining military jets will ensure its dominance over forecast timeframe. For instance, in 2015, the U.S. military entered into a strategic contract alliance worth USD 1.1 trillion with Lockheed Martin for maintaining the U.S. F35 fleet through 2077, providing growth prospects for the industry expansion. 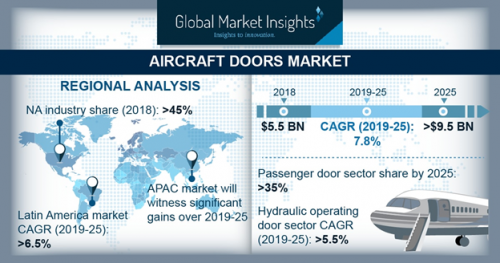 Key participants in aircraft doors market place include Latecoere, Aernnova Aerospace S.A., Saab, Mitsubishi Heavy Industries, and Elbit Systems. Industry players are continuously investing in R&D for developing innovative solutions for manufacturing light weight products to strengthen their presence.